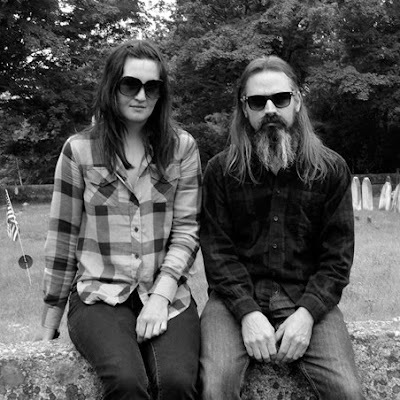 Moon Duo are the mystical side-project of Erik Johnson from bearded space-rockers Wooden Shjips. With bandmate Sanae Yamada on keyboards, Erik gets to delve further into the hazy world of fuzzy electronic-tinged psychedelia and the results are pretty damn lovely. There’s a real blissed-out feel to their music….like Silver Apples, Moon Duo carry you into a trance and leave you crumpled in a zoned-out heap. I send a list of questions to the band for an interview for Cork newspaper The Evening Echo before their recent Irish gigs, but because the band were on tour they didn’t get the answers back to me in time. So here they are, unedited. Though brief, I hope they give a little glimpse into the curious world of Moon Duo. How is the tour going at the moment? Any tales from life on the road? The tour is going great. Late nights in Berlin, great food in France, sort of your typical travel experiences. Plus we’ve met amazing people all over who are putting on great shows. Are you looking forward to playing in Cork – have you been to this city before? Do you have any ties to Ireland? We’re really excited. I was just in Cork this past spring with Wooden Shjips but Sanae has never been. My grandmother’s side of the family was from Ireland so I have distant roots. But Americans just feel a special kinship with the Irish. We both enjoy it. Sanae has always loved travelling but I’ve just started to find my groove on the road. Does being a duo – compared to Wooden Shjips for example – give you a sense of flexibility that being in a larger band doesn’t? Conversely, does it limit you in any way? different dynamic, just having the direct connection between two people. Erik, what do you enjoy most about Moon Duo? I like recording the most, but also translating that to the stage. Sanae, what do you enjoy most about Moon Duo? S: I like playing live because it forces me to live in the moment. Does the word ‘moon’ in your name have any significance – to some it is a mysterious entity and symbol, with mystical powers. To others, it is simply the moon! What is it to you? It’s both! The moon is special because it can represent so many things and it has real influence over the earth. But to me the best thing is that it gives you a real sense of awe when you see it on a clear night. It allows you to connect with space so easily, and put this earth and our lives in an amazing context. There’s a psychedelic feel to your music – at times it’s as though you could bring the listener to a trance-like state. What is it that you like about evoking this sort of a blissed-out mood? I just see it as the power of rock n roll. Simple repetitive beats, electric guitars. It creates a feeling that is very unique and powerful. You did some covers of Christmas songs – do you find you get nostalgic about certain songs? I get nostalgic about all kinds of things but songs do have that quality. As do certain smells. It’s odd how a particular song or smell can bring back very specific feelings from the past. We’ve been listening to Waylon Jennings and Lee Hazlewood in the van. But some of the recent records I’ve been enjoying are by Sun Araw, Purling Hiss and Cave.